The tofu marinade is awesome Harini , I use the same for paneer , since the tofu here is not really great . Simple , yet a delicious tofu ! The grilled tofu looks amazing Harini. I can try this with paneer.. Very interesting and flavorful ingredients in the marinade. Great idea for a quick snack. 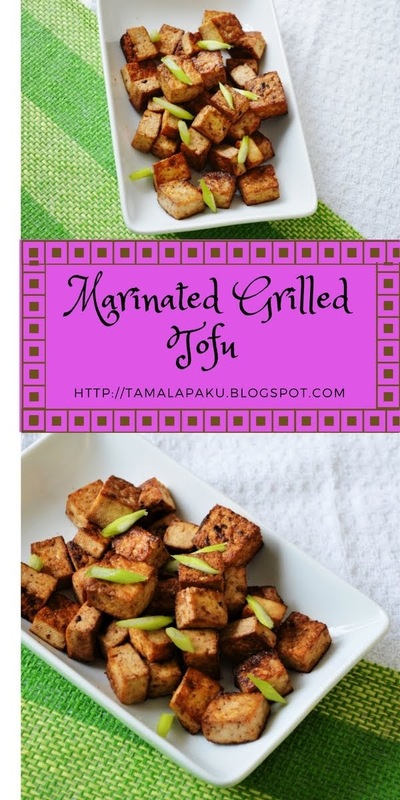 Never get bored of tofu, such a fabulous grilled tofu to have with some spicy sauces. I so agree with the relaxed blogging. When I wrote the first post for this month I felt so free..hehehe..very nice grilled one and if kids love it, nothing like it! Grilled tofu looks fantastic. But never tried tofu so far, guess i would try the same with paneer. Love how simple the recipe is !!! The marination sounds interesting and interesting,look amazing. We love tofu too Harini. Your baked tofu recipe is literally calling my name. Looks so crispy and delicious. Pinned to try real soon. The marinade sounds delicious. The tofu we get here is not so good. Can try this on paneer which is the kids favorite!